When I’m stressed, I eat. This meant that the days leading up to my wedding my appetite was insatiable. My husband-to-be convinced me that dinner at a Chinese buffet the night before was probably not the best idea. 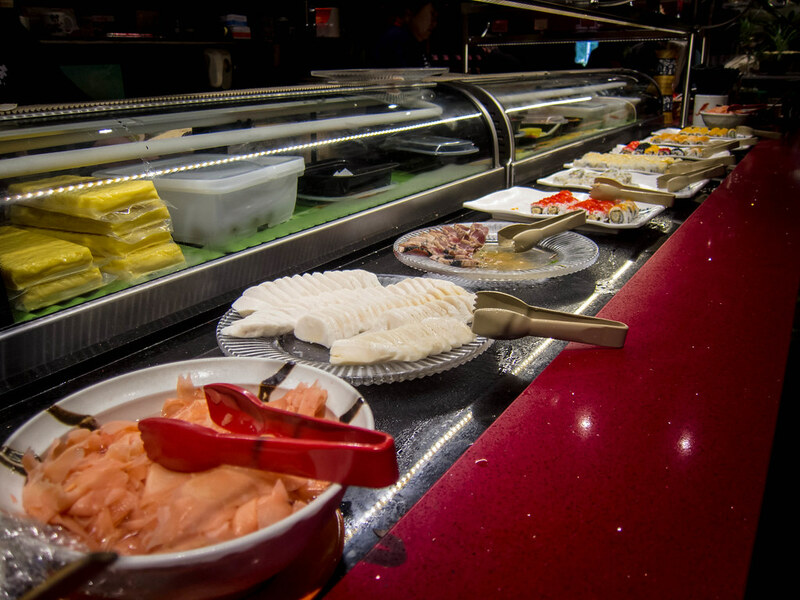 The Monday after though, we went and stuffed our faces at Dragon Legend Buffet. Atmosphere: The building that Dragon Legend took over used to be a Chinese banquet hall so there’s plenty of space and could easily sit a hundred people. The interior decor was as elaborate as the building exterior, filled to the brim with Asian motifs and wall decor. Tables were large and wooden chairs were heavy. The stage area remained and two large screens on each side of the dining hall is now used to show Chinese TV shows. 3 VIP rooms are available for private events although we saw tables set up in the main dining area for groups of more than 20. The buffet area where are the food was set up had wide aisles and wasn’t crowded. There was lots of room to queue and browse. 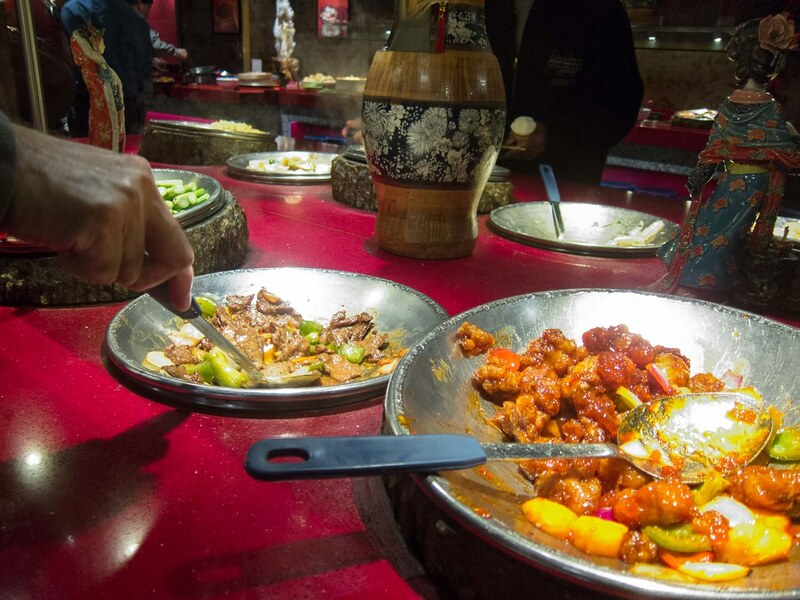 Each dish had an individual spotlight over it and a description in Chinese and English. Service: None of the wait staff were unfriendly or rude, but it was clear they were just there to get the job done. This was especially true for anyone manning a food station. I’m sure it’s not easy and some customers probably try to get around the portion limits, but the servers paid little attention to you other than dropping food on your plate and there was no break in conversations between themselves. 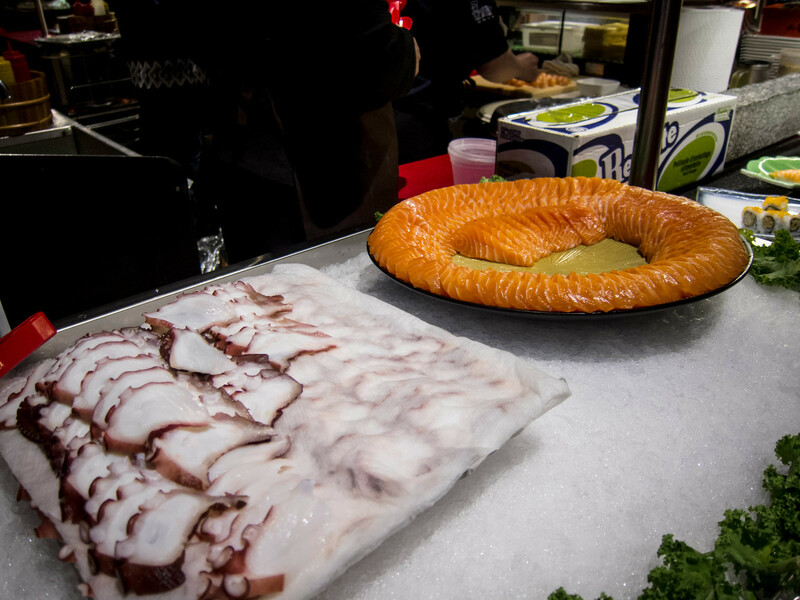 At the sashimi station, each visit was limited to 3 pieces of salmon and 2 pieces of octopus. At the Peking Duck station, the limit was two wraps each. 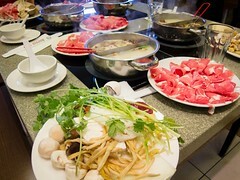 Food: Hands down, this was one of the best buffets I’ve ever been to in terms of selection and quality of the food. At dinner, there was dim sum, a grilled station, salad bar, sashimi, maki, prime rib, Peking duck wraps, hand pulled noodles and a slew of Chinese stir frys. 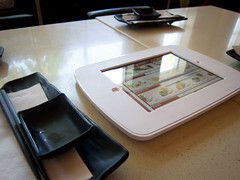 Sushi and Sashimi – I was impressed by the quality of the fresh fish, especially the tuna and salmon. 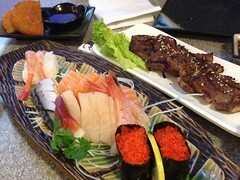 There was squid, rolls, seared tuna, tamago and a lot more choices. Hand Pulled Noodles – Noodles are hand pulled and the flavour rotates every half an hour (spinach, normal, pulled, shaved), diners can choose between three toppings (ie. 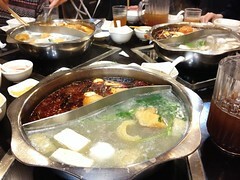 BBQ duck or pork) and 3 soup bases. This was one of my favourite stations. 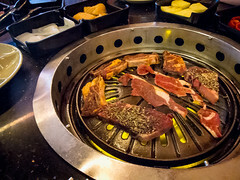 Prime Rib – Carved to order, the beef was cooked to a medium well, juicy and was tender. 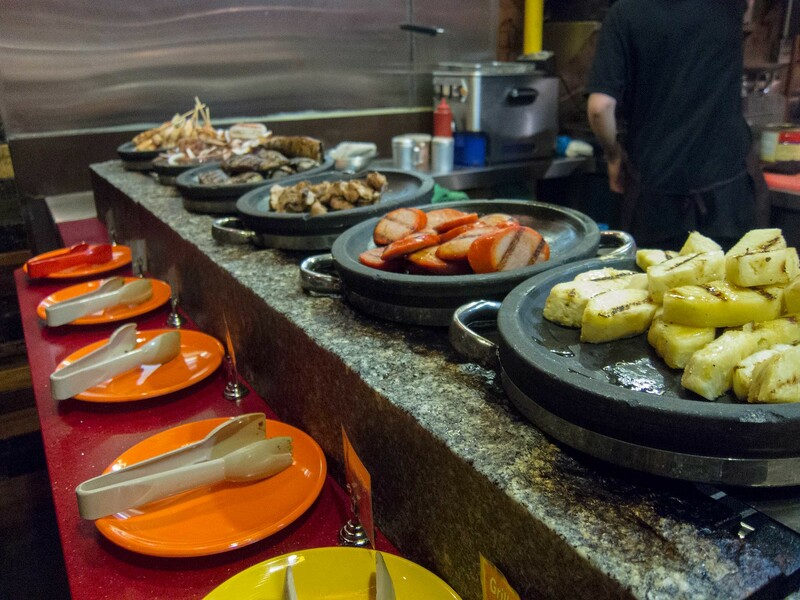 Grilled – So many choices! You can also order grilled steak on the spot, it’s diced, seasoned, soft and a hidden treasure. 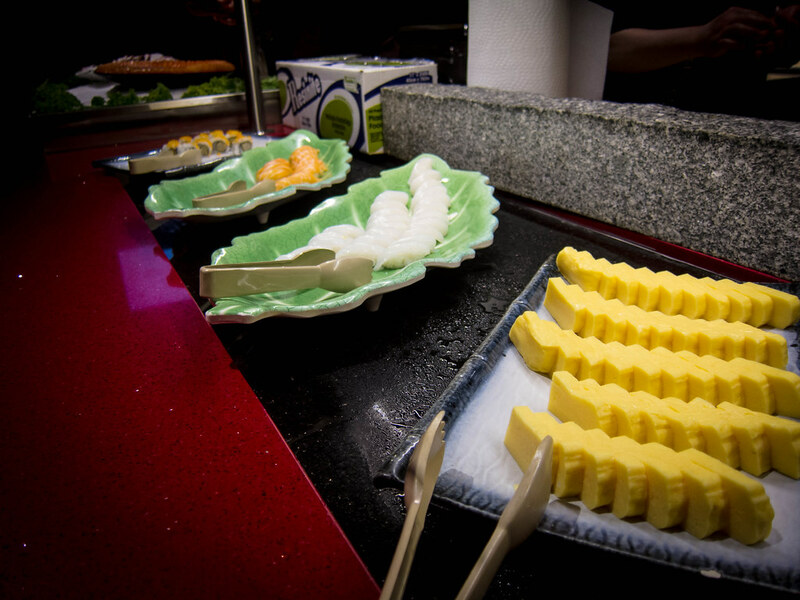 There was also squid, red sausage, skewers, pancakes and my favourite, pineapple. Peking Duck – A this station, you state if you’d like one or two wraps and the server places them on your plate. They try to make sure each wrap has an equal amount of skin and meat pieces. Hoisin sauce, sliced cucumber and green onion were self serve. This wasn’t the best Peking Duck, but not bad (I ate 3 wraps). Salad Bar – In addition to greens, there was wakame salad, kimchi, cold shrimp and mussels. Dim Sum – A disappointment, the steamers are left warming for too long and the dumpling wrappers were thick. I would skip this station and save the stomach room. 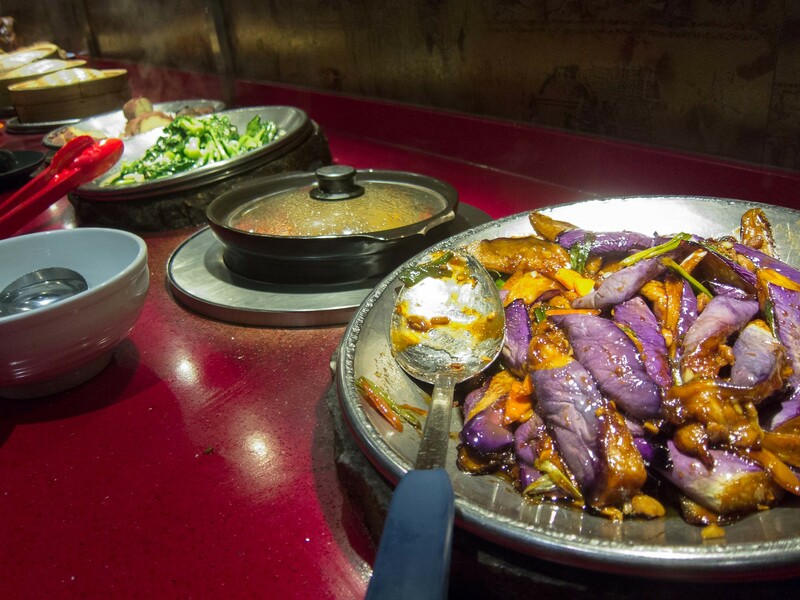 Stir Frys – There was a good variety of classic Chinese dishes like Eggplant, Sweet and Sour Chicken and plenty of vegetables. I did find the dishes on the oily side but they were well seasoned and will satisfy the craving for dirty Chinese food. Dessert – Dessert was split into two areas, the usual ice cream flavours (including Green Tea and Mango) and a table filled with cakes and pudding. Overall, the cakes were underwhelming, a little dry, while the mousses and puddings fared better. I’ve now been to Dragon Legend twice, the first with The Hubby’s immediate family and the second time with a bigger group of family. Based on these two visits, I do believe that Dragon Legend has a good selection of food, lots of variety and is an excellent choice for a family gathering (picky or big eaters). You are paying for the quality and selection though at $26.99 per person for dinner Mon-Thu and $31.99 Fri-Sun and Holidays. Personally, I’d rather rather spend that much elsewhere.